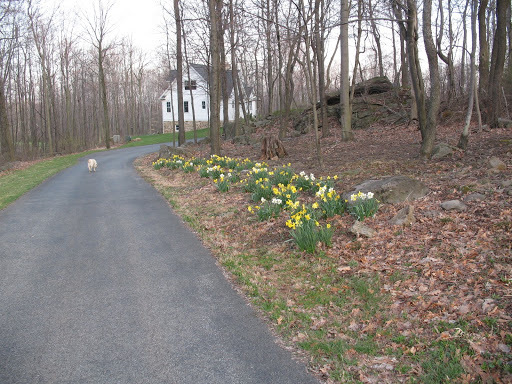 My fabo family purchased this beauty for me for Mother’s Day and I wanted to share how pretty it is with daffs blooming at it’s feet. DH worked very hard to install this, our farm isn’t called Touchstone for nothing, much shoveling and digging and rock moving. 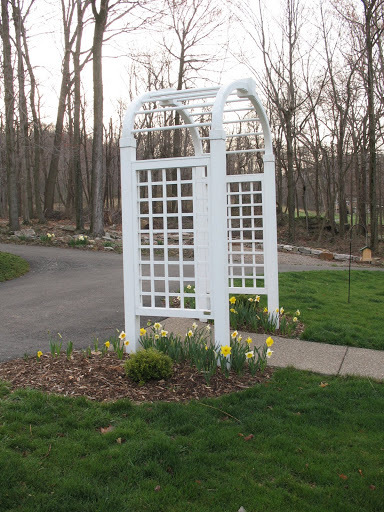 I can’t wait for the New Dawn roses I ordered to arrive so I can plant them to grow up and over. DH, however, doesn’t want me to “whore” it up with plants. He thinks morning glories would be just fine. 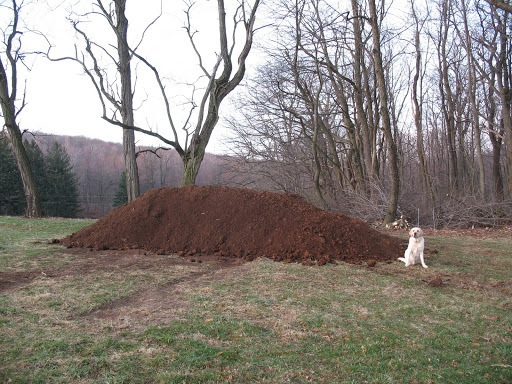 Silly man, doesn’t understand a thing about vertical elements in the landscape. Keep tuned we’ll see who wins this one. I have to admit, it is really beautiful even without the rose. 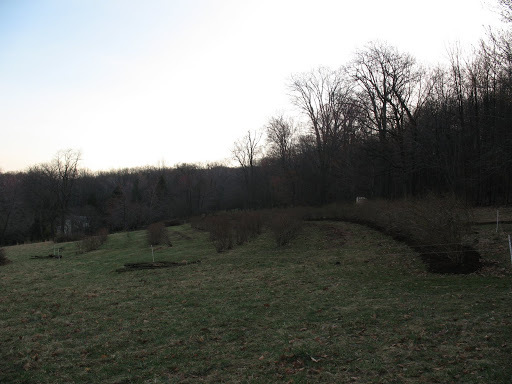 Th blueberry fields… Last year we purchased the adjoining field to our farm. Included in the sale were 450 blueberry bushes. We were thrilled as we love blueberries and it seemed like a fun operation. 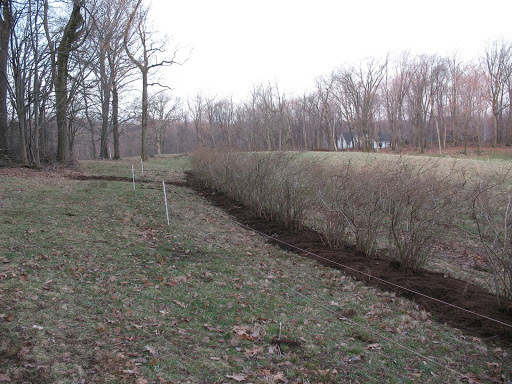 This spring, DH, who is very conscientious, began the arduous task of pruning 450 blueberry bushes. He did a wonderful job and everything looks so clean and orderly. 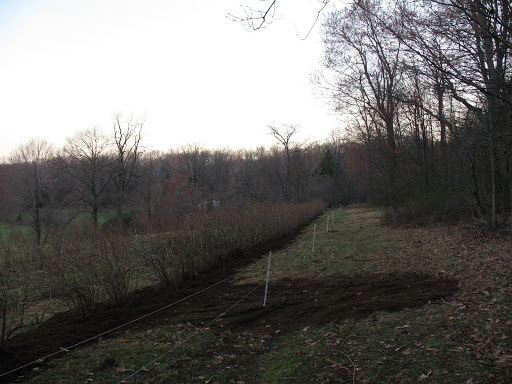 The bushes also need to be mulched with sawdust to reduce the backbreaking job of keeping the weeds and grass from competing with the blueberry bushes for nutrients. So we had this delivered. That is one row, folks. 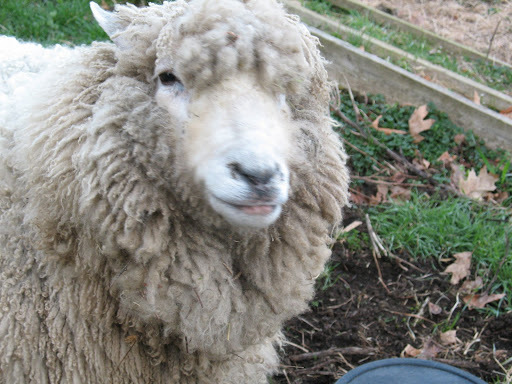 So guess what we are doing this afternoon.The fun never ends at Touchstone Farm, aka Embraceable Ewe. Cleaning house looks like a walk in the park compared to this. Wonder how many points I earned on Weight Watchers. Girls, this one is for you, the view over the boo berry patch, sorry the horizon faded so much. I took this pretty early this morning. Thought you might like some pictures of the only Embraceable Ewe left on the farm. We reduced our flock to one old ewe. Hayleigh is a sweetie like her mom. She is now about 8 and can’t have anymore lambs. Last year when our own baby, DD#2 (Boo Bear), aged out of 4-H, DH asked me to sell the flock. I sold everyone but Hayleigh. No one would take her and she adds a certain wooliness that a knitter should have available at all times. Nice to see a sweater on the hoof, don’t you think? Anyway here she is, “her Hayleighness”. 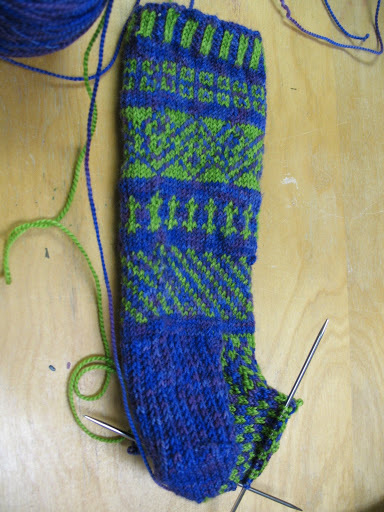 This is DD#1(Sweet Pea)’s first sock, purdy ain’t it? She came up with the design all by herself with a little help from Priscilla Gibson-Roberts. 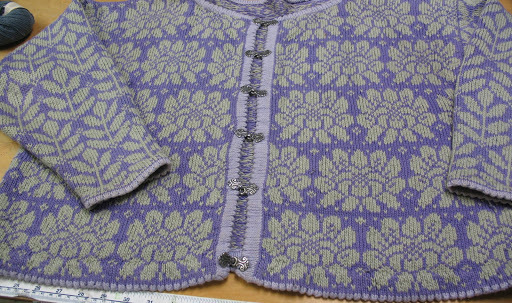 The yarn is from Candace Eisner Strick’s line of beautiful lightweight wools. Sweet Pea knows where I keep the “good stuff” and headed right there. Since it was for school she knew I would not refuse her. Smart girl, our Sweet Pea. She was knitting it for a design competition in the Architecture school. Unfortunately, she ran out of time and space. Never fear, she has other knitting in the exhibit and I should have pictures of the show for next week. I made this sweater about 8 years ago and wear it all the time. Actually, I am wearing it out. If you look closely one of the clasps broke right off and the hem of the neck needs to be resown. I wear it often and receive tons of compliments. And before you ask, I did steek it and cut it even though it is cotton. 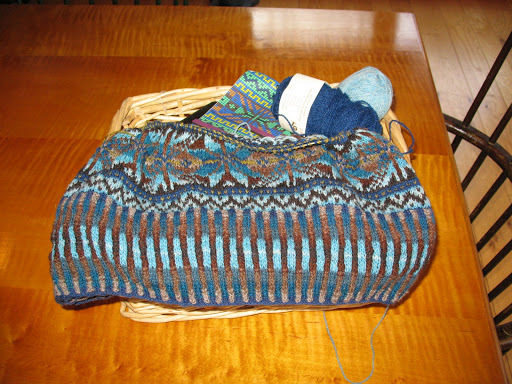 Love Fair Isle in cotton and I have been cutting away at them for years. Just be sure to reinforce with very small machine stitching before you cut. But this is what happens when I can’t do one project during the day, obviously I have become ADD or maybe ADHD with my knitting. I have started 6 new projects in the last 2 weeks. Focus girl, focus. 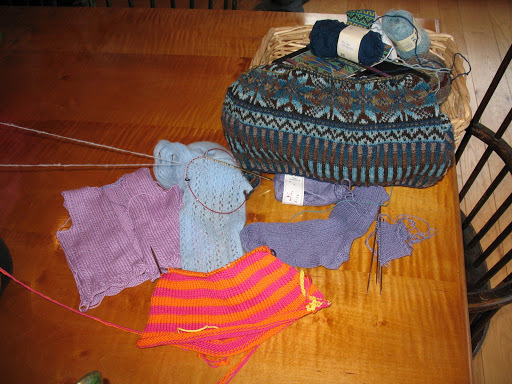 I think I am coming to believe I am a process knitter and don’t seem to care if anything ever is finished. I’ll let you know how this all turns out.